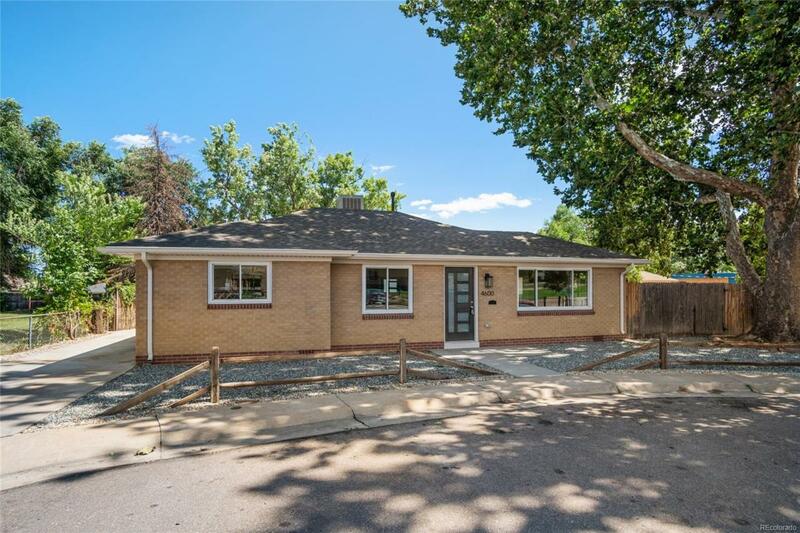 ABSOLUTELY STUNNING FULLY REMODELED RANCH STYLE WHEAT RIDGE HOME WITH A THREE CAR GARAGE ON A LARGE FLAT LOT! This beautiful home has been professionally remodeled from top to bottom and all work has been permitted! - Step inside and enjoy a wide open modern floor plan with solid oak hardwood floors throughout. Interior features include: New electrical service, recessed lighting throughout, new plumbing, new interior doors and trim, new bathrooms, new kitchen with white shaker cabinets, stainless appliances, under cabinet lighting, and quartz countertops. Outside you'll find an expansive lot with a large flat yard and private back patio shaded by a spectacular sycamore tree. Exterior features include: New exterior doors, a brand new detached three car garage, new roof, new landscaping and front walk. Located minutes from downtown or the mountains and steps to the new Ridge at 38th corridor and the popular Clear Creek Trail. No detail has been overlooked, come see it today!